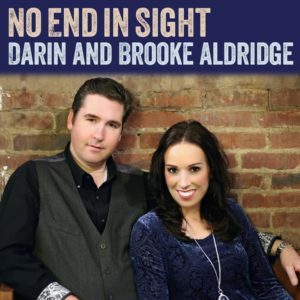 Coming off a year of remarkable success, North Carolina’s Darin and Brooke Aldridge bring their new single “No End In Sight” an impassioned anthem that serves as the perfect follow-up for their success trajectory. “No End in Sight” is a love song. Optimistic, heartfelt and inspiring. It’s a staccato groove that punches a tight rhythm behind Brooke Aldridge’s flowing vocal lead that soars above and shows again why she is the reigning IBMA Female Vocalist of the Year. The song is performed by an elite line-up of players including Darin Aldridge on mandolin, the unique guitar work of Zeb Snyder (Snyder Family Band), accomplished bassist Mark Fain (Ricky Skaggs and Kentucky Thunder/Chris Hillman), and the skillful fiddle and vocal harmony of band member Carley Arrowood, winner of the 2017 IBMA Momentum Instrumentalist of the Year. The song also welcomes the sophisticated style of newest band member Matt Menefee (Cadillac Sky/ChessBoxer) who brings a New Grass touch to the banjo work. “No End In Sight” is available everywhere to stream, download or purchase digitally and releases to radio today from Mountain Home Music Company.